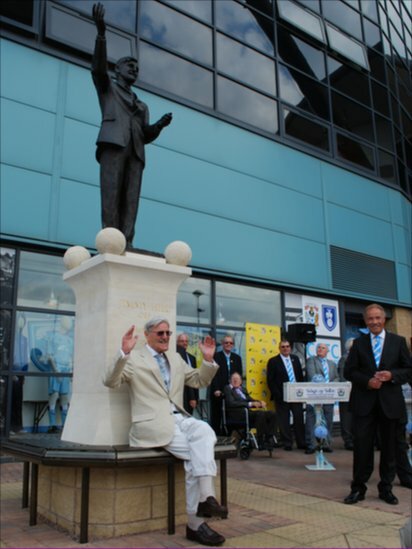 Jimmy Hill punched the air with delight as he visited the home of Coventry City Football Club, the Ricoh Arena, to unveil a 7ft bronze statue of himself. 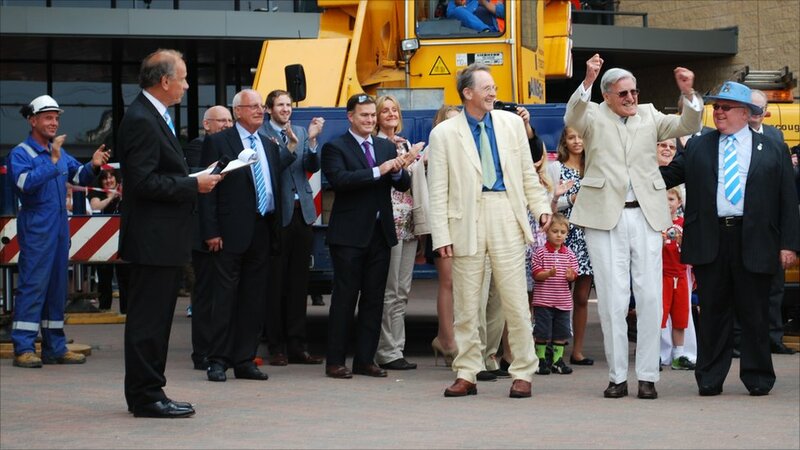 He wore a Coventry City tie for the occasion. 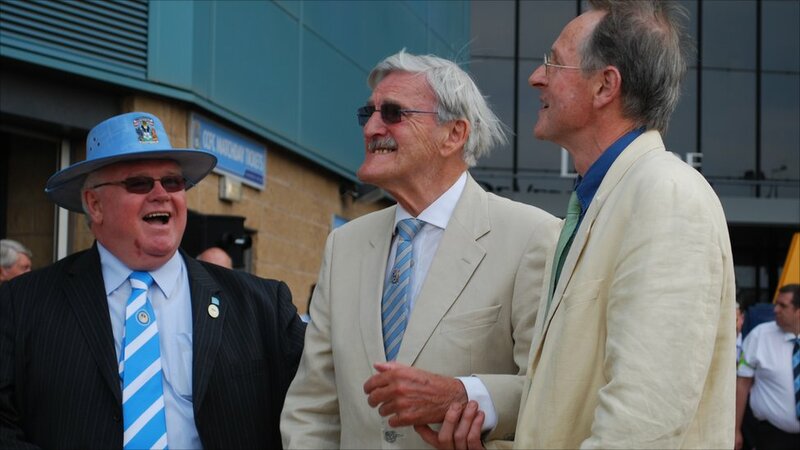 Jimmy Hill, who is now 83, became the manager of Coventry City when he was 33. 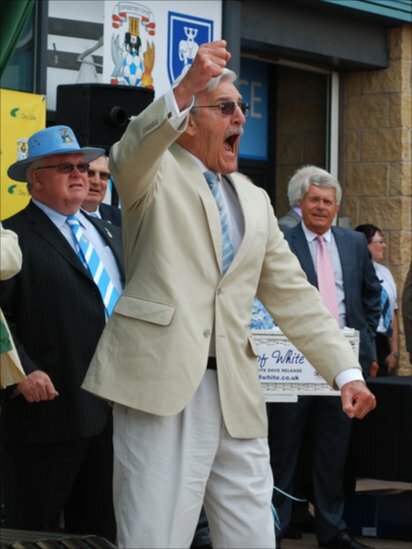 He created a great era for the team and pioneered the Sky Blue Revolution. 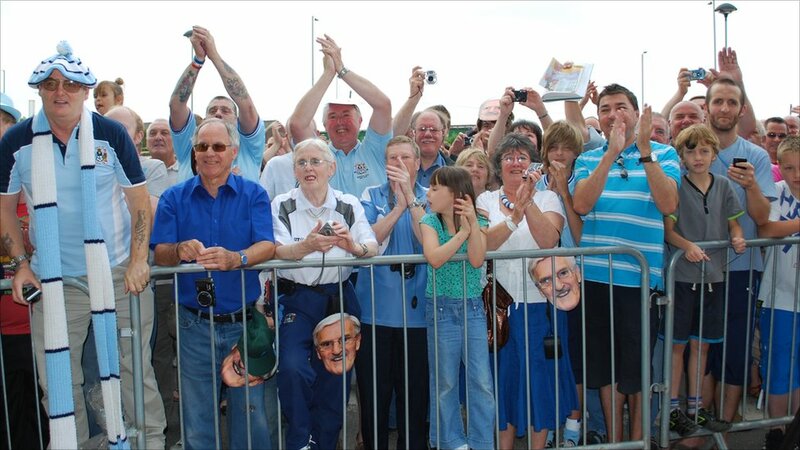 The Ricoh Arena held a family fun day in honour of the unveiling and fans brought their own Jimmy Hill masks. Talking about the statue, Mr Hill said: "It's a fantastic one. It's the only time in my life that I've experienced anything like that, it's very, very special." 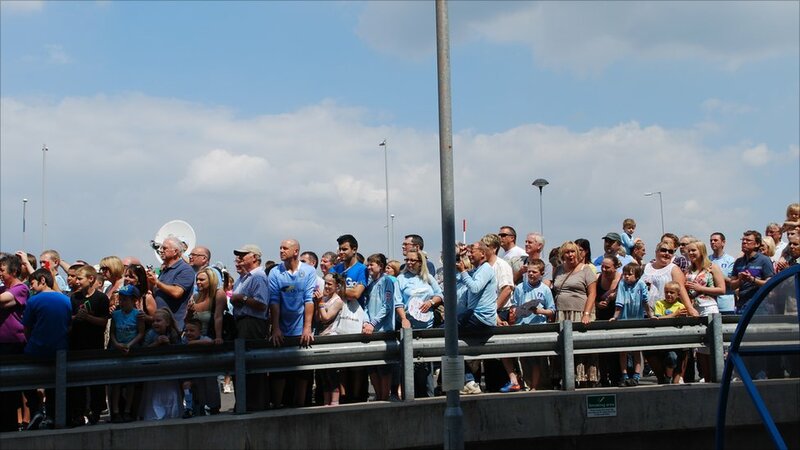 A sea of Coventry City supporters wore the Sky Blue strip, complimenting the sky above. Talking about the statue, Mr Hill said: "To have so many people around who are also looking at it [the statue], I'd like to say thank you to those that have made the decision to put my face up there. Whoever is involved in that group, thank you very much indeed." Following the unveiling, 21 doves were released from baskets. 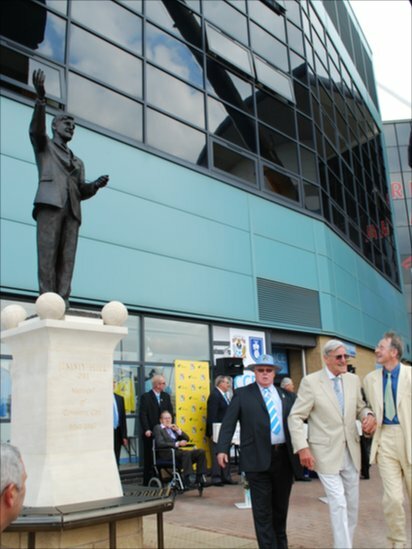 Kevin Heffernan, from the Jimmy Hill Tribute Appeal, and Nicolas Dimbleby, creator of the statue, joined Jimmy in admiring the finished piece. It is hoped that the statue will remind fans of the club's successful past. 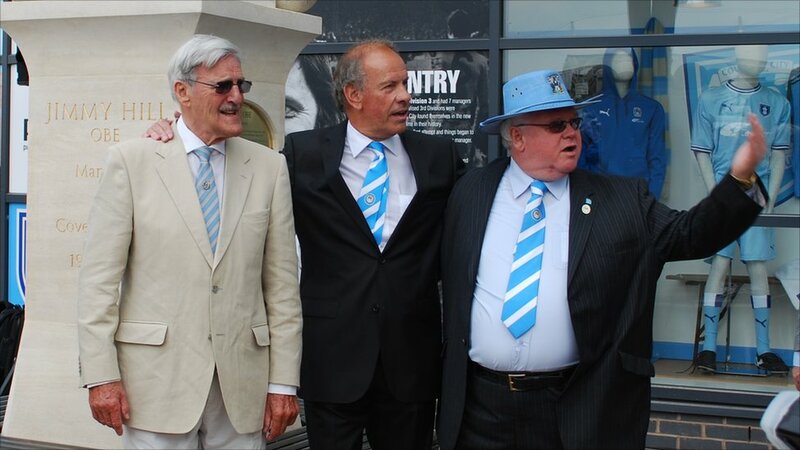 Former club chairman Joe Elliot (third from left) said: "He was here for six short years as manager... six years that actually speak everything that he did. He is an icon." 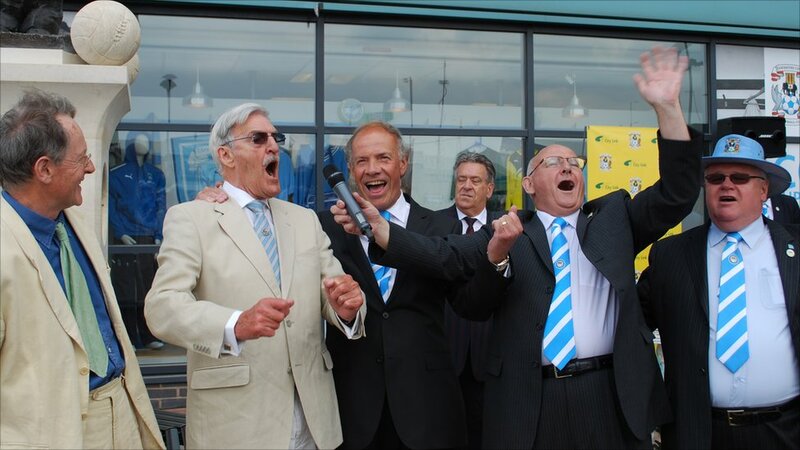 Jimmy Hill also penned the famous Sky Blue song, which is sung to the tune of the Eton boating song and is still loved by fans to this day.